I just took a big deep breath. I can't believe it has been 60-days since I launched this blog and my new personal brand dedicated to helping others build their small business. These 1st 60 days have flown by and I have already learned a ton of lessons. I decided to start writing monthly reports about my business so that I can really pull back the curtain on what I am doing each and every day. I never want anyone to compare themselves to anyone else - BUT it can be helpful to learn from other small business owners who may be further along in their journey. This is all about showing you the exact processes and tools I used to get my results. I'm going to forewarn you - I did not have 200,000 page hits and get 5,000 subscribers in one month. Can that happen? I'm sure it CAN but is it typical or the norm? It's really not. While I didn't become an instant small business guru overnight, I did make some pretty big strides and I noticed that I am gaining momentum. Ready to see the results? Growing my e-mail list has been my number one priority in this new small business adventure. One of the very first things I did was create several lead magnets that I could place on my website and drive traffic to as an opt in. My main traffic driver was Pinterest. 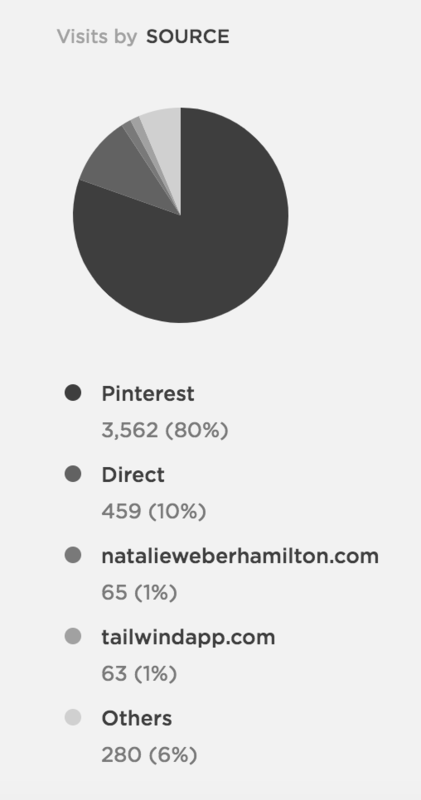 In fact over 80% of my blog traffic comes from Pinterest. I did see the growth slow over the last 15 days which I really attribute to me not creating as much new content and not staying on top of my marketing and driving traffic to the blog. **I am still using Mail Chimp as my e-mail service provider and I'm overall happy with this choice. It is FREE until you reach 2000 subscribers so for now this is perfect for me. My marketing plan for my blog in these first two months primarily rested on Pinterest. I focused a huge amount of time and attention on optimizing my Pinterest profile and growing my Pinterest reach. You can see that on April 22, 2018 my average daily reach was about 40,000 average monthly viewers. Now I am averaging about 420,000 monthly viewers - a growth of 718% over just 60 days! I'm pretty proud of this growth but it did take quite a bit of commitment and showing up daily. I started using Tailwind to help me to schedule pins that will be posted throughout the day so that I don't personally have to be online constantly. Truth be told I did not earn one cent from my business, YET. In these first months of my new business I knew that I needed to work on building a content rich blog and SERVING my audience. While I didn't earn money I did spend money - eeek. I'm considering it an investment that hopefully will be returned ten fold. So, that's it! If there is one lesson I've learned over the past 2 months is that consistency is KEY. It is so so important to be consistent on social media to drive that traffic to my website and to grow my e-mail list. How are you working on your business? Reach out to me and tell me about it! !